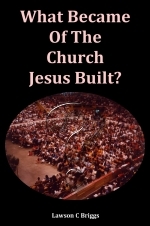 What Became Of The Church Jesus Built? How many years was Solomon king? Jesus Christ said, "I will BUILD My Church." Did He build it? That Church, said Jesus, would never be extinguished. "And the gates of hell [the grave]," He said, "shell not prevail against it" (Matt. 16:18). Christ's Church is to last through all ages. Has it? Where IS it, today? Is it divided - composed of more than 400 different, disagreeing, arguing sects? Only ONE Church: What is a "sect"? According to Webster, it is "a group that has broken away from the established Church." And all of today's host of sects or denominations have broken away from the Church originally established - they teach different doctrines and observe different practices. But who "established" the true Church?